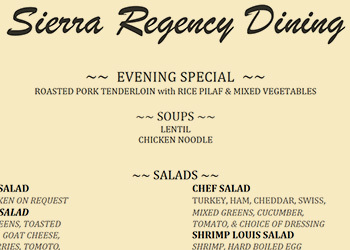 At Sierra Regency, we feature all-day dining in our restaurant-style dining room. Two meals are included in the monthly rent. 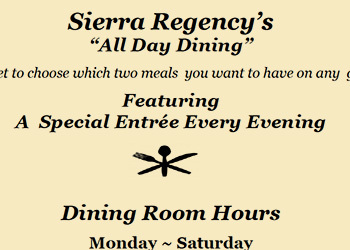 Our residents have the leisure of choosing which two meals they would like to enjoy Monday through Saturday. On Sundays, we feature brunch and dinner only. 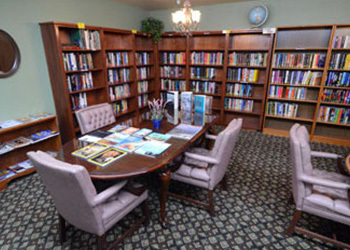 We are proud to provide our residents with a ‘help yourself’ breakfast bar along with our featured soup and salad bar at dinner. We offer a variety of dishes, and our menu changes frequently. Please contact us with any questions.